Simply elegant! Former model home with over $40,000 in upgrades. Beautifully landscaped and impeccably maintained, pride of ownership shines. The spacious great room features vaulted ceiling, 17'' tile, built-in speakers, security system, and gas fireplace. Kitchen has stainless steel 5-burner gas stove top, built-in oven, microwave, and dishwasher. A classy French door leads to the outside. Granite, maple cabinetry, and mosaic tile back- splashes are tastefully coordinated in kitchen and bath areas. A split bedroom design affords privacy to the master suite with tray ceiling, upgraded carpeting, double sinks, soaking tub, separate shower, and huge walk-in closet. Enjoy additional living space in the cozy back courtyard with covered porch, stone patio, and raised garden. Extended garage is fully finished and insulated with extra lighting and outlets. 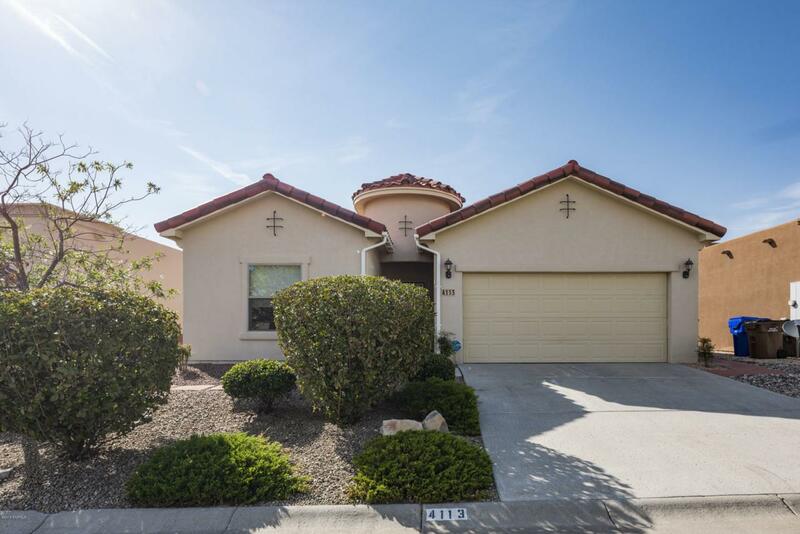 4113 Espana Way is located near the pool and fitness area in the gated Pueblos 3 community. Make it your place today.